Matt Carpenter has been the most valuable second baseman in baseball this season. His batting average (.321) is good for 8th in the game, OBP (.394) 11th, and his 28 doubles lead the National League. At 4.4 fWAR, Carpenter ranks as one of the top 10 overall players in baseball this year. And while prominent defensive metrics, such as UZR, have him as a scratch fielder (-0.1), he passes the eye test in the field and has made his fair share of diving stops and difficult catches. More importantly, Carpenter has not only solidified the jumbled mess that was the second base position for the Cardinals in 2012 (cumulative .06 fWAR), he’s made it a position of strength. Barring complete system failure, Carpenter will obliterate his pre-season projections and our wildest Opening Day fantasies of what we thought he could be. As it stands, Carpenter is projected to best his initial ZiPS projection by 4 full wins. That’s bananas. He’s most certainly in the conversation with players like Chris Davis and Carlos Gomez as the breakout star of 2013 and may very well find himself in the NL MVP debate if he keeps it up. As of press time, Matt is in the salsa capital of the world, New York City, enjoying his first All-Star Game appearance. As with any player who exceeds expectations so furiously and pole vaults into the top tier at his position, the only real question to ask is, “How long can he keep it up?” A skeptic sees the regression cliff right around the bend for Matt, while the eternal optimist and message board GM figures it’s high time Kolten Wong got traded for a rent-a-starter because Carpenter’s got the second base game on lock down and everyone knows you can’t trade Freese. And if we knew the answer to what the future holds for Matt Carpenter, we would huddle together and devise a plan to make money off of the information. As it stands, we can only take a stab at projecting it. Dan Szymborski at Fangraphs already did that with his updated ZiPS projections for 2013, and the results are disconcerting. ZiPS sees a sizable drop coming for Matt Carpenter in the second half in every meaningful measure of a hitter’s salt: OBP, SLG, wOBA, wRC+. Where Matt put up 4.4 wins to this point, ZiPS see’s him adding a measly 1.6 wins the rest of the way – a massive disappointment for those of us wanting an 8 win season from a position we were praying would be league average only a few months ago. In reality, if Carpenter finishes a +6 win player in 2013, we should have our head examined if we feel even a trace of disappointment. But digging deeper into Carpenter’s performance in the batter’s box this season, there are some glimmering bright spots in his batted ball profile and plate discipline stats that explain his success to date and suggest he’s probably just a damn good hitter. When you watch Carpenter hit, you think, “Wow. He really smacks that ball on the nose.” And that is confirmed by his 26.6 line drive percentage – good for 7th of all qualified hitters in baseball. You also feel like he makes contact at an astounding rate, which is confirmed by a 90.5% contact rate on balls he swings at – good for 11th in all of baseball. Lastly, you applaud him for having a “good eye” and not swinging at junk. And this is confirmed by an absurdly low 22.2 O-Swing% (percentage of balls outside of the traditional strike zone that a batter swings at). Add that up, and you have a hitter who often hits the ball hard and doesn’t chase. That’s a recipe for success. While there’s always a worry that pitcher’s will figure out a guy riding a heat wave like Carpenter and start to pick at his weak spots, a quick look at his heat map from the season to date doesn’t show a lot of weakness. From the graph, we can see that he’s vulnerable against balls up-and-in (0/20) and has had trouble laying off some pitches due south of the middle of the plate (1/17), but otherwise he shows tremendous plate coverage. And while Carpenter’s walk rate is merely good (9.6%, 54th in baseball), he often doesn’t feel the need to take a walk because he’s busy roping doubles. Few things are a given in life and even fewer in baseball. It’s entirely possible that the first 3 months and change of 2013 have created wildly unrealistic expectations for fans and aren’t indicative of Matt’s true talent level. Knocking squarely on wood, Carpenter could hit a rough patch coming out of the break and eventually steer out of the skid and level off somewhere well below his current production level. It’s possible. But it’s more likely the Cardinals knew exactly what they were doing when they told Carpenter to prepare to play second base this off season. 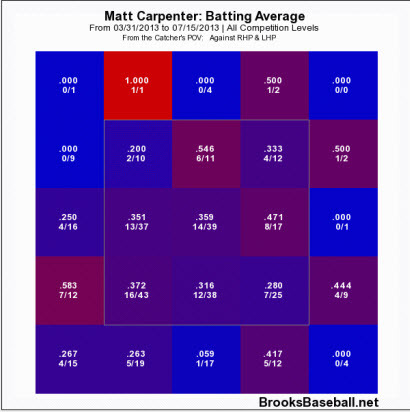 It’s more likely Matt Carpenter was waiting for his chance to break out.